• Not all "view" rooms have a great view. • Bands below can be heard in rooms. As far as "cheap" hotels in Las Vegas goes, The D doesn't feel "cheap" at all, yet still sports prices in that category. 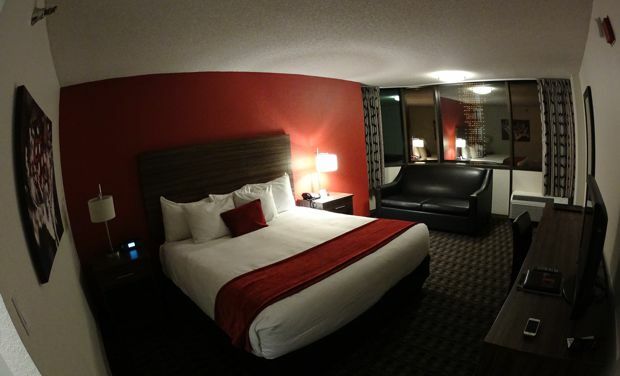 If you want to stay in downtown Las Vegas, The D is a great choice. Today I offer my review of The D hotel in Las Vegas, situated downtown along Fremont Street. The D Las Vegas Casino Hotel in Las Vegas stands on the same property occupied for many years by the legendary Fitzgerald’s. It was renovated and re-opened in late 2012. When I first heard about “The D” my first question was, what does The D stand for? Apparently “The D” has multiple meanings. It is said to stand for “Downtown,” also one of the owner’s nicknames, and the owner’s hometown of Detroit. I stayed at The D Hotel on November 10, 2014, which was a Monday night, in a “Premium Corner King” room. Below are my observations. There is a parking garage for The D, which is at Carson and 3rd Street. If you are a guest, parking is free. Otherwise, it is $2 per hour. If you have a guest key card, there is a separate slot where you can enter your key upon exit. If you are a guest, they will tell you to keep your key card and use it when leaving in order to avoid parking garage fees. I found that even on a weeknight, the garage was mostly full. I had to park on the 11th, and top, floor. Although the hotel and casino have been refurbished, it doesn’t appear to be the case with the parking structure, which has an older feel to it. Check in was easy and the women working at the front desk were friendly and helpful, even as I asked multiple questions with this review in mind. I should point out here that the elevators at The D require that you type in your desired floor on a keypad outside the elevators, and you’ll then be instructed which elevator to board. It’s an interesting concept, although it does seem strange to have no buttons inside the elevator. Although I reserved a Premium Corner King, I have to admit I was slightly disappointed that my view from the 12th floor wasn’t as spectacular as those shown on the website. In fact, part of my view looked right into the parking garage. But it was still a nice look down at Fremont Street. Perhaps another caveat is that the West side of The D is perched above the stage at Fremont Street where bands play. Even up on the 12th floor, I could decipher every song being played by the band below. 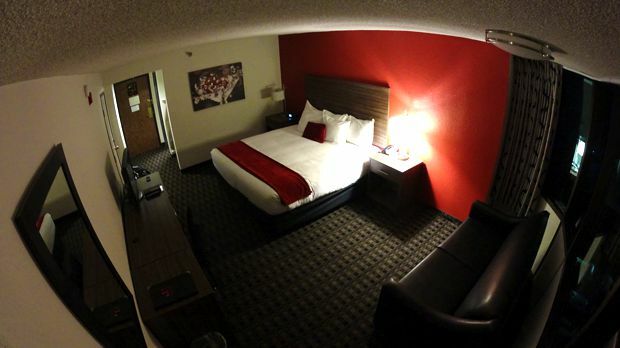 The room itself has a bed, couch, television, and desk. There is a small area next to the bathroom to hang clothes which includes an ironing board and iron. (I would call it a closet, but there is no door). There is also a mini-fridge held within the desk, which was not apparent at first glance. I was pleased to find an empty fridge, rather than a fully-stocked one with overpriced “conveniences” that some hotels offer. Although the cost of Vegas hotels varies greatly on any given night, I picked this room up on an off night for about $40, plus a $20 resort fee. The resort fee is said to include internet access, although – as seems standard with hotel WiFi – it was too slow for my tastes, and I opted to use my cell service’s tethering device instead. 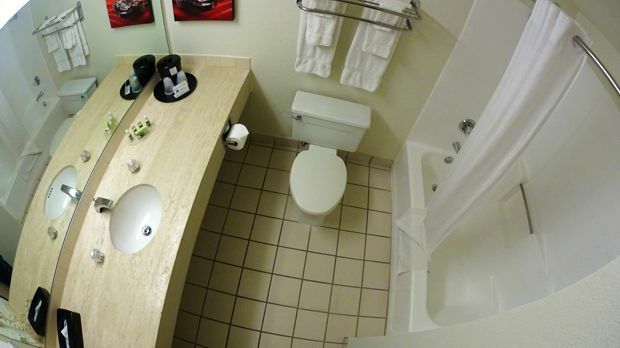 The bathroom is standard, with a toilet, tub/shower, and sink. It’s roomy enough to get ready for a night out. I had a difficult time shutting the water off after taking a shower, but otherwise there was little of note there. Below is a short video tour of the room. Walking through The D feels like old Vegas, which may be a welcomed site to some, but not to others. The second floor casino is meant to have an old school Vegas casino vibe to it, and there were those who seemed to prefer that area. Unlike the resorts down on The Strip, where there are areas which feel like hotels and areas that feel like a casino, The D casino spilled into almost every nook and cranny of the main floor. There were video poker machines feet away from me as I checked in. It felt very “casinoey” to me. The D spills out onto Fremont Street, right next to where bands play. 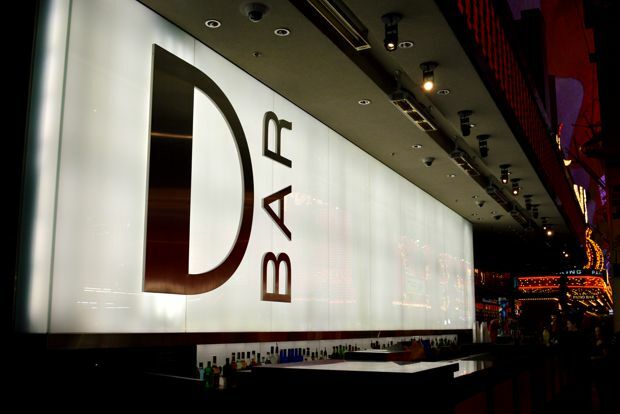 Featured bars at The D are the Longbar, purportedly the longest bar in Nevada, and a similar bar outside on Fremont Street called simply “D Bar.” There is also an external escalator allowing guests to access the second floor casino directly from Fremont Street. For everyday conveniences, there is a McDonald’s inside The D, and you can walk out onto Fremont Street to access a host of shops and eateries. Not to be outdone by its Strip counterparts, The D offers fine dining with Joe Vicari’s Andiamo Italian Steakhouse along with casual eats at American Coney Island. My stay at The D was pleasant and uneventful. Be aware that some corner rooms include a view of the parking garage, and rooms on the West side may not be as quiet due to the band playing below. I felt that my room was clean, and the staff was prompt and attentive. As far as “cheap” hotels in Las Vegas goes, The D doesn’t feel “cheap” at all, yet still sports prices in that category. If you want to stay in downtown Las Vegas, The D is a great choice. Have you stayed at The D? Rate it and give us your comments below.